You might think that I used PhotoShop to enhance this photo, but this was just as Mother Nature gave it to us. Actually, it was even more spectacular in person. I have never seen a sunset as brilliant as this one. I was sitting in my office on a December afternoon, when I looked out the window and saw that the sky was turning pinkish-purple. I told the Hubby not to expect dinner any time soon, grabbed the Soni and headed to the beach. I sat there taking photographs and enjoying the splendor for probably an hour, watching boats go by rippling the bay, taking notice of the spectrum of color surrounding me, which was pretty much a 360. As the darkness started to descend, I turned around to leave, only to find about 50 other people behind me taking in the same moment. I was so absorbed in the beauty that I didn’t even know I had company. Nope, I didn’t need rose colored glasses on my lens this fine evening. (I have been known to do that with purple shades I used to wear). Lest we forget . . . this photo was taken in a place where it rains 100+ inches a year. Many days would be gloomy and overcast, (or just down right rainy, sometimes even blowing sideways). That’s when I would bring out the yellow tinted glasses. They made me feel like the sun was shining after all. Oh happy day! 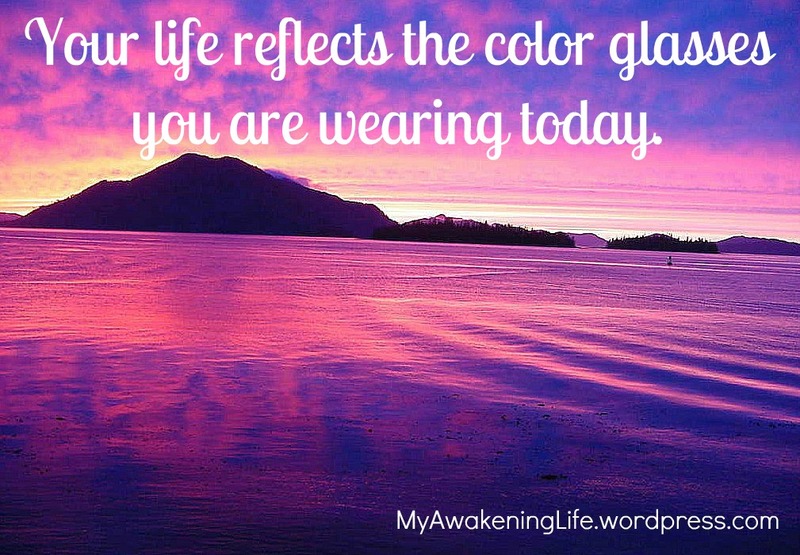 Your life reflects the color glasses you choose to wear. Choose your colors wisely!! ← If this boot could talk . . .